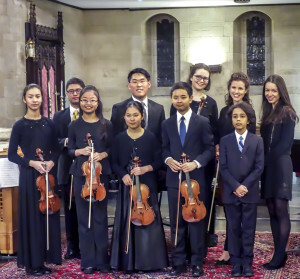 The World Youth Alliance Chamber Orchestra is an ensemble of young musicians (ages 10-17) from Manhattan’s most prestigious music programs including The Juilliard School and Manhattan School of Music. The aim of the ensemble is to inspire international cooperation by reflecting the ideals of the World Youth Alliance. The orchestra has performed internationally at World Youth Day in Madrid, Spain and domestically at venues such as the United Nations, Westbury Gardens, and Fairfield University. Auditions for the orchestra are held annually in May and June, or upon request. For further questions, email alexis@wya.net. To support the World Youth Alliance Chamber Orchestra, contact Alexis Kende (alexis@wya.net / 917-639-5774) or click the button below then enter the amount you wish to donate.